You can click on the different pages you would like to visit. WE HAVE A NEW WEBSITE!!!!! 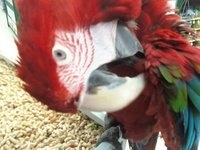 The Bird Nerds Rescue and Sanctuary is dedicated to the Rescue, Rehabilitation and Adoption of domestic parrots. 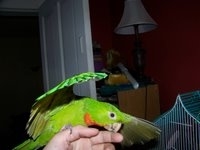 Positive reinforcement, as well as enrichment items are used to curve and correct behavioral problems and turn unsocialized parrots into adoptable companion parrots. 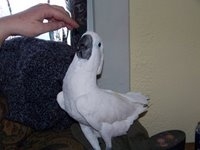 We will find birds loving homes, and find them any medical attention they need. 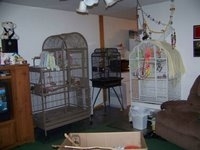 If you are having a baby, moving, or just can't take the screaming, The Bird Nerds Rescue is available to you. 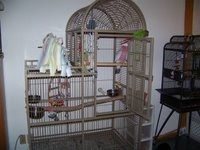 We also provide a bird sanctuary for birds not eligible for adoption. If you need to place a bird with us, just email us, we check our emails every day! Unfortunately we are unable to take in sick and/or injured wildlife of any kind. 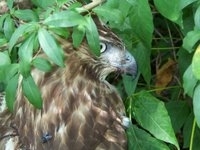 You must have license from the State of Ohio to take in and rehabilitate wildlife. 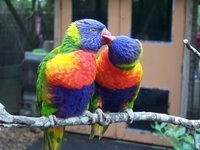 We are only able to take in Domestic Birds. If you do find any wildlife that needs help you can contact local Vet Offices as some of them will take in and rehabilitate wildlife. We are now on Petfinder.com!!!! Please look at our "Previous Rescues" page to see more of our previous rescues! 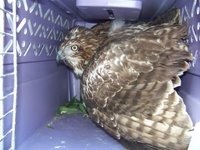 I rescued this Hawk after being contacted by a local Police Department. They told me they had a Hawk that was injured and his only choice was to put it down. The officer didn't want to put him down so they called me to come get him. He was attacked by something and needed emergency medical attention. I wrapped him in a towel and put him in a carrier and transported him to a local Veterinary Hospital that takes in wildlife. They will take him and do what they can for him to save his life. He had some puncture wounds but they did not look life threatening, hopefully they will be able to release him back into the wild. 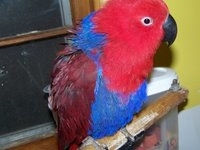 To take in unwanted, neglected or abused parrots and give them a chance at enjoying the rest of their long happy lives, with their best interests in mind. To rehabilitate those parrots that can be rehabilitated and place them in permanent homes or to provide a sanctuary for those parrots who are unsuitable or ineligible for adoption. Provide education and resources for all potential and current parrot owners, including diet, needs and other care requirements. 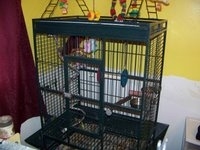 To find an adoptive home that will provide a bird with the same or better care than it has with us. 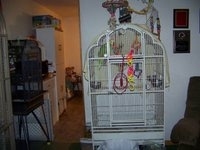 Please visit this site for safe and reasonable bird toys that we use for our birds!!! 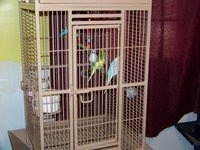 Our birds are kept in large cages and are spoiled rotten! We only take in as many birds as we can handle ourselves, we will not take in too many because it is unfair to the birds.